Last month our artful collaboration with Infectious produced some awesome Firefox inspired art for our community to enjoy as laptop and iPhone skins, wallpapers, t-shirts, and Personas. Today the community will have a chance to get involved and get creative. We’ve launched an Infectious design challenge around the theme: “People & Robots: Best Friends Forever” to give everyone an opportunity to showcase their work and a chance to win some great prizes! 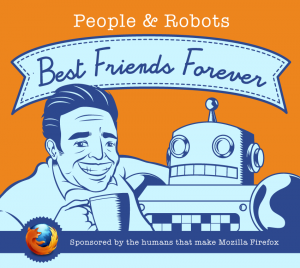 The Mozilla community is all about people and technology working together, and we’ve already seen some cool robot art during the beta releases of Firefox 3 and Firefox 3.5, so the People & Robots theme was perfect… and the design challenge is a great way to introduce our community to the Mozilla Creative Collective. So get involved as a creative contributor and show the world why you love robots!